CNC Machined 6061-T6 Billet Aluminum. Complete bolt-on solution to run top feed injectors. Clears factory IACV. Runs 11mm injector tops, and 48mm (2") in length. 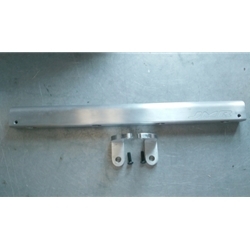 Kit includes fuel rail, fuel rail fittings, lower injector seats & mounting hardware. *** Stock VE with stock VE throttle body +$49. Notify us if you have this setup.